in Dynamic Omega demo in the monster bash table I am tweaking. @Gimli: I will look a it tommorow. ... and another FP error fixed. For me, it was one of most annoying bug: broken flipper geometry and stupid ball direction after some hits. 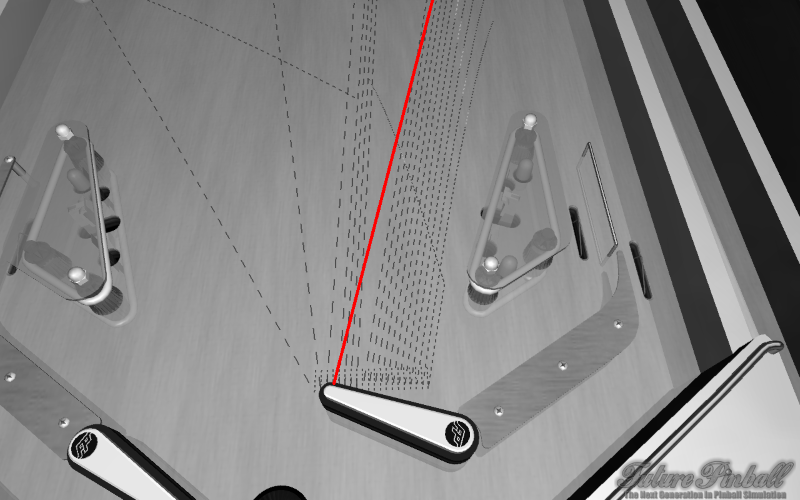 When ball is hit near flipper tip sometimes it fly, like top surface was not flat but concave. At image some dimmension are not realistic, but this way problem is more visibly. 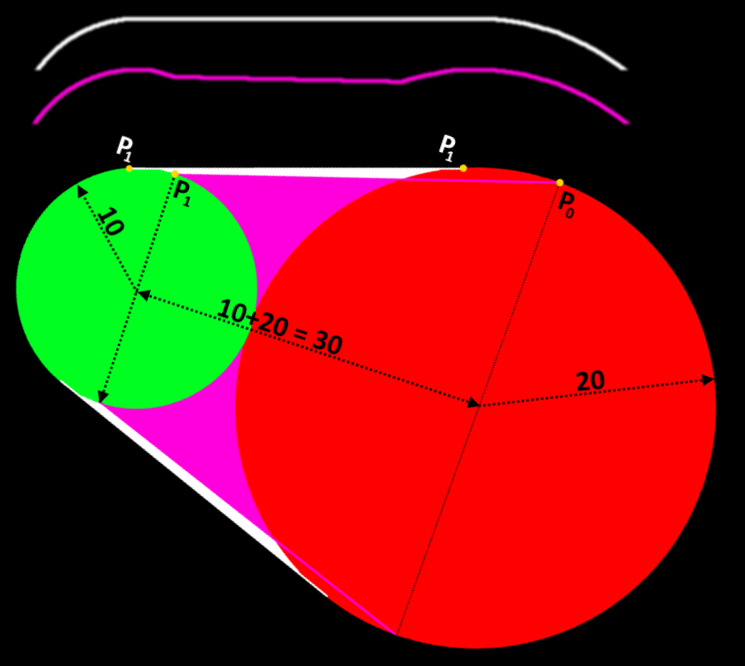 Flipper physic-sim-model have 3 parts: 2 cylinders (red and green circles) and space between point P0 & P1. FP by default uses black points on image and surface in pink color is part of flipper. You can see, that white surface from flipper is "missing". In new BAM i use "white" P0 and P1 points instead "black". Result: Top flipper surface is flat, not concaved. 2. When ball hit flipper in place near tip, physics engine reports 2 contacts with flipper: one with line between P0 and P1, second with green cylinder.... and for some reason ball is bounced always like from cylinder. So, even if we have "flat" top surface, that surface is ignored and ball is bounced only by green-cylinder. I have found way to force on physics engine to ignore in some cases "green-cylinder". Fix is complicated and require calculations when is real ball-flipper-contact-point and prediction of collisions. I can guess, that my fix will not remove all errors, but i hope it will be almost all. Bad thing about fix for that second case is: It require in Flipper_prehit subroutine (even empty one). Stunning! How did you find out that? known fact with FP, and not just the flippers. FP also gets very confused when you have two objects overlapping that are set to different materials, like metal and rubber. This results in the ball skipping or seeming to hit something when there is nothing there, and even sometimes just stopping and falling back downwards. I've noticed it's usually at the point where two objects set to 2 different physics intersect. The best way to combat that is actually very simple. Just have the ball travel along a non-rendered wall instead. really good for long looping shots, and seems to help with the gates as well. There is some big collision and physics problems there, interesting you found it's the same problems (so to speak) with the flippers. @Rav - The ball has been doing that with the flippers since day 1. I always felt as well that the ball was "sinking" into the flipper (hence my flipper wall technique) so that's another one you have fixed. I have also noticed that FP can do strange things when it strikes a object with multiple control points, like a very finely shaped round rubber tip. I've actually had the ball balance perfectly on the top of rubbers and just stay there (especialy with exe from SlamTilt) and am finding the less control points the better. It makes sense with the flippers as you were describing your problem would have the same problem. Wow, the one thing we are all learning is just how bad FP stock physics really are. Ball speed & FPS in XML. Ball speed and FPS param in physics XML are related. First some experiments. We want to find max ball speed on table. For every physics simulation frame it try to find ball on playfield and if ball exists it reads ball speed. When it checks if it is faster than previous max ball speed. In FuturePinball_KeyPressed is use "1" key on numpad to reset "maxballspeed". This way i can check max ball speed, when it is hit by plunger, reset it and find max ball speed when i play. - ~2700 after pluger hit. - ~1800 after flipper hit fast moving ball. Ball can traver up to 2700 mm in 1 second. So, if i split it by physics sim FPS i get: 2700 / 256 = ~10.5 mm between 2 physics frames. Ball diameter is 27 mm. Do you see where may you have problems? Gate is "thin" object. In one frame ball may not touch gate (no collision) in next frame gate may be 10 mm "inside" ball and physics engine will have to solve what to do. You can guess, that on some tables ball may be faster. How it looks at current "Moster bash" beta table? So, we have: 4850 / 295 = 16.4 mm. Over half of ball can sink into wall before collison will be detected. I guess if you have gate with metal part 17? 18? 19? mm above playfield sometimes ball can fly under gate without hit detection. Evene if gate will be hit, ball center may be already at other side of gate and physics engine may decide to spin gate in oposite direction. Any way.... my advise: limit ball speed hited by flippers or increase FPS. My next post will be about flipper rubber elastic coeficient and new demo table. BTW, it's a fantastic new Rav!!! Is there a way to limit the maximum and not effect the speed otherwise ? A "Speed Limiter" or "Speed Governor"
But having a speed limiter if possible might be better ? I will think about ball speed limiter, but i can't promise anything. Please replace "CInt" with "Round". This should fix problem. If expected_ball_speed_after_hit / xBAM.Ball.Speed < (base_elasticCoef-0.2) Then raport = raport & "[slowdown]"
If FlipperExt.AngleDiff > 1 Then raport = raport & "[flipper in air]"
@Gimli: you should add it to your monster bash. This version change only elastiCoef for flipper, but in my opinion makes big difference in game play. In short it allows for easy control how ball bounce from flippers. All that without lossing control over flipper shots. It may be easly combined with other "OnPreHitFlipperSettings". So, you can in main "OnPreHitFlipperSettings" subroutine call OnPreHitFlipperSettings_bounceControl to make game play easier and OnPreHitFlipperSettings_linearomega to controll shots. ... and table devs can add code to change behaviour during game. Last edited by ravarcade on Thu Dec 06, 2018 7:15 am, edited 2 times in total. I am so glad this is opening up a new vista for us. once again claiming FP physics were poor...I had an epiphany and connected the dots. It does open Pandora's box as there are so many things to explore...but any improvement is a major gain.. It would be awesome if this reinvigorates FP and validates all your amazing work ! Wow! Rav the "Bounce Control" routine works very well. I added to monster bash both with and without linearomega control and it was awesome. Thanks for fixing the left flipper bug and crash bug ! I won't have much time in next 4 days as we have guests visiting. I am interested to hear if blue and the others have tried any of this! This is RC. I hope to release it in next 24h. @Gimli: xBAM.BallSpeedLimit... well it works, but for example in your monster bash it creates one more problem to handle for you. If you limit ball speed to 3000 your "super fast flippers" may be faster than ball. - ball will get hit with same speed as it gets now. - flippers will not look always as "overpowered" like it looks now. - .... and when flipper hit ball, when drag ball, when flipper will move faster.... so user will get impression, that flipper will hit ball stronger when you push button harder. (Just ty it).